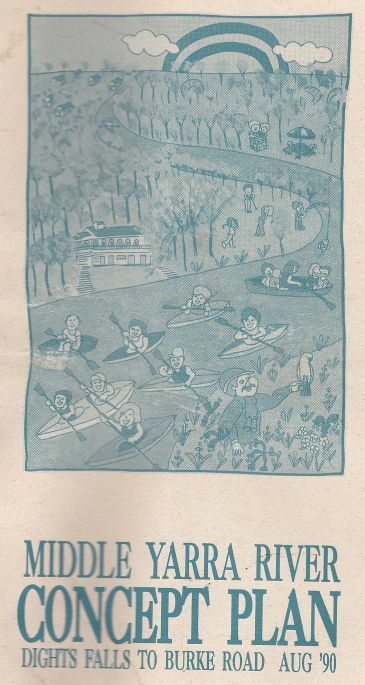 In August 1990 the Department of Planning and Urban Growth, and Department of Conservation & Environment drew up a Concept Plan for the Middle Yarra River from Dights Falls to Burke Road. The following extracts (p.52 - 53) relate to the 'Burke Road Park' area. "Hyde Park, to the south of the freeway and Kilby Road, is linked to Willsmere Park via the freeway tunnel. It is well maintained and should be landscaped to reinforce the existing landscape character. There is a proposal to install training lights around the hockey fields in Willsmere Park. However, only two of the three proposed lights should be installed to limit illumination of the northern end of the billabong and consequent disturbance to wildlife. The lights should be baffled and directed to limit the spill of light to the billabong and adjacent residences. The long term future of the playing field should be investigated to determine opportunities for relocating them elsewhere in Kew and returning this land to passive recreation. This unit consists of two private golf clubs: Green Acres and Kew. Both are located on flat, flood-prone land and have Yarra River frontages. The embankment of the Eastern Freeway forms the southern boundary of Kew Golf Course. The unit consists of the River Course, Bushland, Eastern Freeway and Sports Areas Management Zones. It is recommended that, in general, the golf clubs plant indigenous species to improve the wildlife refuges and habitats. In some cases, planting should include exotic species in order to reinforce the existing landscape character, especially in Green Acres Golf Course. Planting adjacent to the freeway should screen embankments while at the same time allowing for views from the freeway out over the surrounding floodplain. If fairways, greens or tees are to be moved or rebuilt, every attempt should be made to relocate them away from the river billabongs and other wetlands. The golf clubs should also rehabilitate and conserve billabongs and wetlands to maintain and improve their value for wildlife. Kew Golf Club should be encouraged to provide public access from Burke Road Park to the billabong on its eastern boundary. Burke Road unit is located on the west side of Burke Road between the Eastern Freeway and the Yarra River. The unit contains riparian bushland, significant wetlands, the MMBW pumping station and the SEC terminal station site. Much of the unit has no system of management and, although it contains significant billabongs and riparian vegetation, the unit is degraded and weed infested, especially by blackberries. Future management will improve access, while protecting and improving the natural environment. Four sub-units have been identified requiring management actions to contribute to the development of the overall unit. The unit includes the Eastern Freeway, Wetlands, River Course, Public Facilities, Bushland, Parkland and Areas Management Zones, see Map 13. Burke Road Park. It is proposed that the sub-unit be developed as a local park. Map 29 shows possibilities for development. Access into the park should be controlled and the park should be rehabilitated by removing weeds, replanting, maintaining and conserving the wetlands. 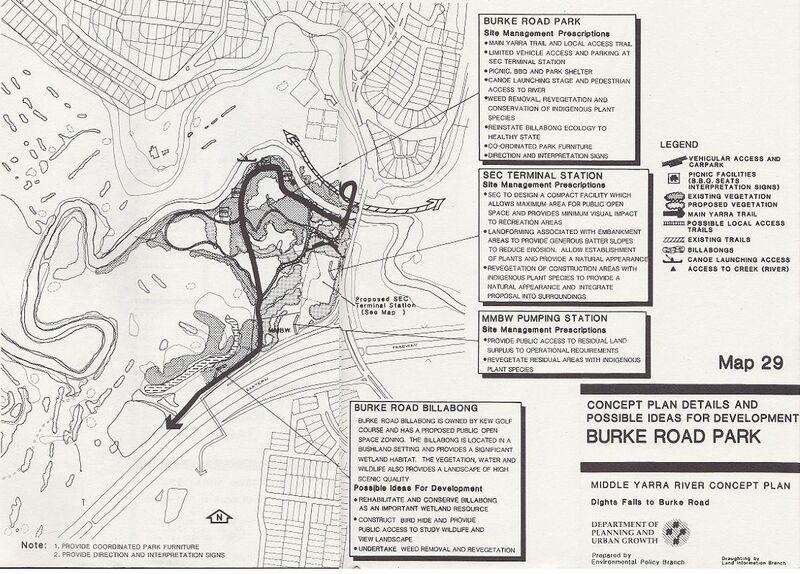 As part of Yarra trail network,' a pedestrian bridge over the Yarra should link the unit to Burke Road North Reserve. * minimising the impact on the floodplain. The visual impact of the facility will be reduced by generous land forming and by revegetating areas disturbed during construction with indigenous plants. The construction of the terminal station will provide vehicle access from Burke Road and limited parking for recreation access. Melboume and Metropolitan Board of Works Pumping Station. The MMBW pumping station is located adjacent to the Eastern Freeway. Public access should be provided to any land not used by the operational requirement of the MMBW and the land should be revegetated with indigenous plants. Burke Road Park. Visitor facilities should be provided, including trails, picnic facilities, barbeques, and shelters. A canoe launching ramp or platform should also be created and pedestrian access improved. Burke Road Billabong. Burke Road Billabong is owned by Kew Golf Club and is reserved as proposed public open space under the Melbourne Metropolitan Planning Scheme. The billabong and its surrounding vegetation are significant wetland habitats, and the bushland setting, water and wildlife together create a highly scenic landscape. Rehabilitating and conserving the billabong as an important wetland resource should be encouraged. Some weed removal and revegetation will be necessary. A bird hide should be constructed and public access provided to enable people to study the wildlife."